In this paper, we develop a theory of computable types suitable for the study of control systems. 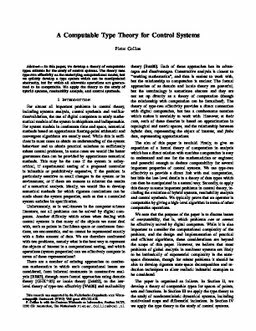 The theory uses type-two effectivity as the underlying computational model, but we quickly develop a type system which can be manipulated abstractly, but for which all allowable operations are guaranteed to be computable. We apply the theory to the study of hybrid systems, reachability analysis, and control synthesis. Collins, P.J. (2009). A computable type theory for control systems. In L Guo & J Baillieul (Eds. ), Proceedings of the 48th IEEE Conference on Decision and Control. IEEE.